I've been blessed with out-of-the-country trips this year. For my past four trips, I only borrowed my mother's luggage. I don't really like borrowing stuff because it saves me from transferred responsibility- If ever I wreck the item, I have no one to blame and there is no one affected but myself. My recent trip to Australia with Olay Singapore (which I will blog about very soon.) 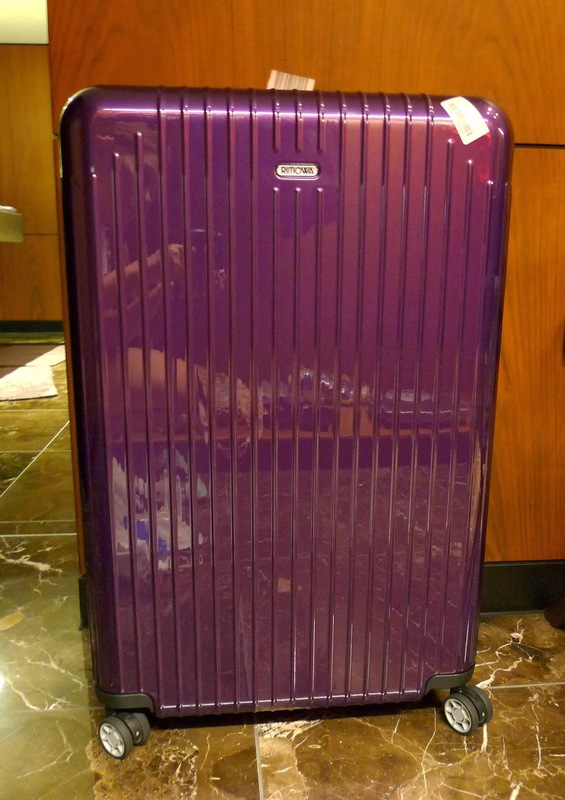 was the perfect excuse to finally buy this luggage that I've been crushing on for a long time now: Rimowa Salsa Air. Tadah! Meet my new luggage. :) Part of the reason why I bought it is because, I admit, I am into branded stuff, but more than that, this luggage is simply perfect for my taste: ultra lightweight and simple, but chic. Rimowa is a German brand of luggage and other leathergoods, and they're globally known for it. 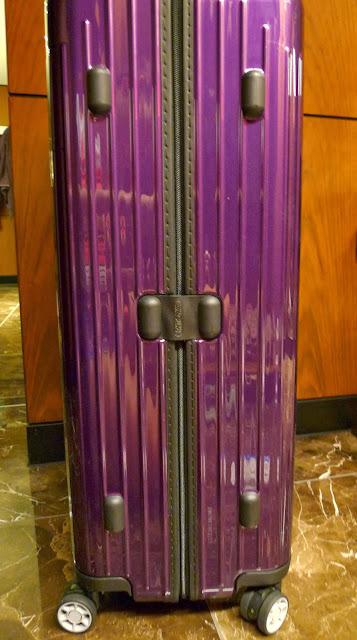 Their iconic luggage is the aluminum case (a must- have for jet- setters), but I found it too heavy, not to mention pricey. 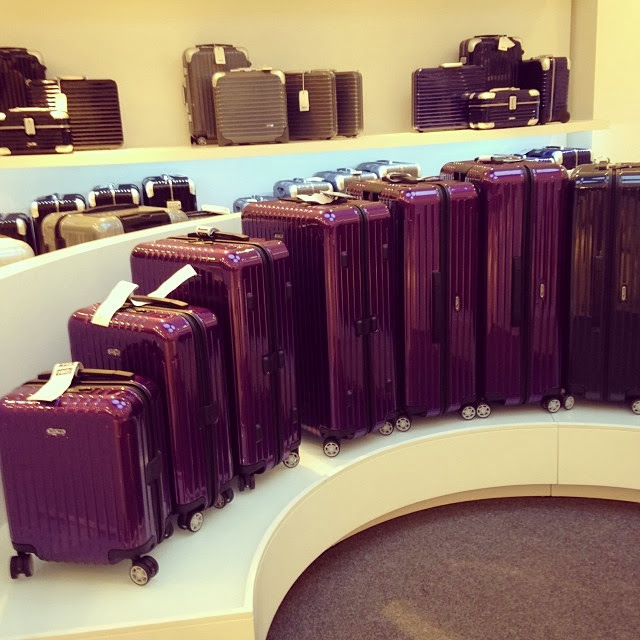 Salsa Air succeeds the original Salsa, which was Rimowa's lightest luggage then. I even read somewhere that Salsa was the first lightest luggage ever produced. Salsa Air was created by Rimowa for those who prefer an ultra light luggage to avoid the dreaded 'excess baggage' cost. Material is Polycarbonate (same as Salsa), the same thing used on the windows of aircrafts and it is lined with thick, genuine leather. This goes without saying that this item is sturdy and will pretty much last anyone for a long, long time. However, it is said to be thinner than Salsa. Salsa Air comes in a variety of sizes and colors-the color I got is Purple (which seems to be the most popular amongst women), size is 94L and has a capacity of 35kg. Salsa Air 94L retails at P27,800.00 in the Philippines. 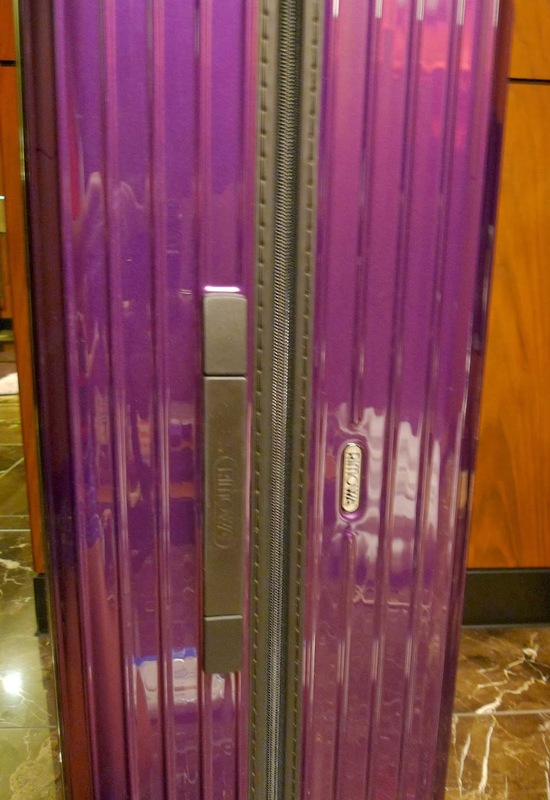 More about this luggage and my thoughts about it after the cut. Salsa Air comes with a light yet solid metal T handle with an adjustable length, whereas Salsa (which my mother has) comes with the classic arch- shaped handle. I like the old style better, but this new one is just fine as the main horizontal handle is wide enough to keep me from accidentally letting go and dropping it to the ground. The body's width is wide and that makes this thing very, very stable. One side has a rubberized handle aside from the one on top of it-this allows me to grab the luggage easily from moving conveyor belts while minimizing impacts on the wheels and body. Those hard falls and hits on the luggage diminish its life and longevity, and having those two handles is just plain brilliant as it allows me to grasp it properly too. On the other side, the luggage has this set of 'feet' to protect the body from scratches in case you prefer storing it sideways. The wheels of Salsa Air have hugely affected my purchasing decision. They turn 360-degrees and will just go with you whenever you're having that "Wait, it's this way. No wait, I think it's this way. Uhm, maybe this way?" moment haha! 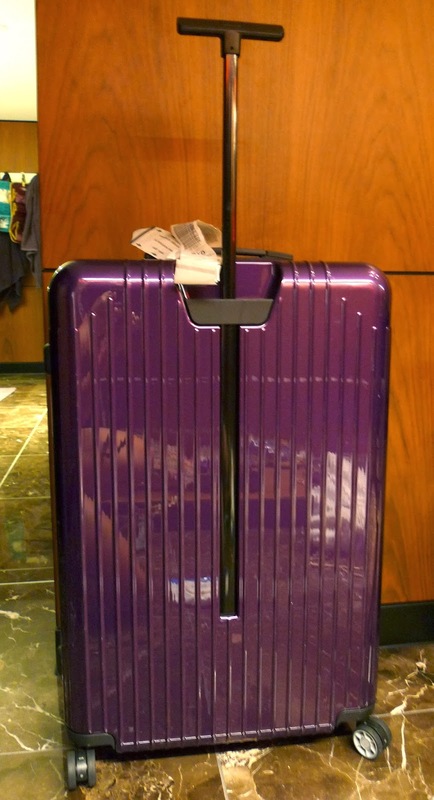 The fluidity of the wheels prevent the luggage from being knocked down or dragged, thus you get to preserve its beauty. I dislike padlocks because I tend to lose keys, and this is another reason to love this luggage: It features a combination lock system and a TSA lock as well. You just set the code, pop the zippers on the holes to secure 'em, and you're done. Have a look at the inside of a Rimowa luggage. It is covered with woven mesh to protect your things like bras and undies from spilling to the ground. Here's a closer look at the mesh. It feels firm and seems like they've used dozens of thread on every row. 1. Issues on reduced thickness and weight- Some said that the reduced weight of Salsa Air made it seem less sturdier than Salsa. I could understand that as the former has a much bouncier shell than the latter, thus it may not be able to survive constant severe impacts. Haven't used my luggage long enough to give a testimonial on this, but as far as I'm concerned, Salsa Air feels quite sturdy. You still have to take care of the item though regardless if it's Salsa or Salsa Air. 2. No Interior Pockets- If you prefer a luggage that's generous on pockets, you might want to ponder real hard on getting a Salsa Air. 3. Non- expandable- Salsa Air's Polycarbonate material and woven mesh do not expand, unfortunately, so you can't fill it to the brim. If you love shopping during travels, opt for compact shoes and clothes so you can make way for your purchases. Over stuffing your Salsa Air may warp its shape and rip the woven mesh. 4. Lining and mesh are not covered by warranty- This is the only bummer here because I always tend to wreck these parts on any bag I have! Ack! Rimowa can only replace missing zipper pulls, but torn zipper and leather linings cannot be replaced nor fixed. Stains and rips on the woven mesh cannot be fixed as well. Rimowa advised me to take the luggage to Besa's in case I encounter these problems. 27,800? for real? whoaaa. Great luggage! I love the mesh idea so your things won't be all messed up once you open your luggage. huwaahhh...tooo pricey for me.. would buy a new laptop for that..though i like the color..
Anyways, I am a bit hesitant in buying shell type luggages because there is a tendency that the personnels in the airport just throw them in the baggage area or cabins (whatever you call them :D) I had the same experience when I went to mexico and my companions new shell type luggage was damged (handle and shell was dented) after we landed. I might not risk that price for that kind of handling and we couldn't be assured of that. i love the color ms m! my fave color.. then i saw the price 27k! --> faints hehe..
i love this detailed review sa maleta nyo ms m so chic and so fab! it's so chic yet so elegant! parang everyone will stare at you in the airport when your carrying this luggage, love this!! Same brand of my luggage bag. I like it super tibay it has been used a lot of times,hiraman lang kami ng mga sis ko. Ginamit din ni hubby when he went to dubai. Salit salit for 7 years now pero okay pa rin sya. Nice pick Ms.Martha! I appreciate the mesh material used in separating the contents of the bag. That's actually an enormous relief when you need to pick out clothes from the inside in a hurry. I was wowed by Rimowa from all the raves it got, but got a little scared when I saw Fashion Pulis' bag get a dent. It was replaced naman, but ang sakit sakit lang isipin.